Games can be designed for any number of reasons. Some come to be because of a love for a particular genre or type of story. Others are conceived because of a love for a franchise or a fascination with a character or public figure. And some games are built around a clever game mechanic that largely defines the game play experience. 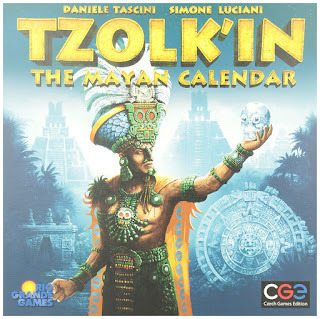 For Tzolk'in: The Mayan Calendar is a game that was particularly build around a central board mechanic - that of the interconnected wheels that represent the titular stone calendars of the Mayan people. Its a clever mechanic that is both strategically challenging and visually appealing. This is not a quick game or an easy game but it's a rich and fulfilling one. And we certainly enjoy exploring games of this complexity during our game nights. Tzolk'in: The Mayan Calendar is a strategic worker placement board game designed by Simone Luciani and Daniele Tascini. The game supports 2-4 players and games typically run under two hours. In the game, the core mechanic is for players to either place workers on the appropriate wheel for the action they desire or take their workers off the board. Placing workers costs more if you place multiple workers in a single turn or chose to place them anywhere other than the zero cost space on each wheel. When you choose to retrieve a worker from the board, you activate the corresponding space, thus gaining whatever benefit is tied to it. But not being able to perform separate place and activate actions on the same turn is the central juggling act of this dynamic worker placement game. The game has many ways to score victory points for end game. You can just try to gather large quantities of resources and hope to convert them to points later on. You can focus on worshiping the gods and claiming resource and points rewards throughout the game. You can aim to build monuments that might had victory point values for other resources or structures you have. Or you can try to gather and place crystal skills for other point bonuses. What I Like: The whole dynamic worker placement for the Mayan wheels may seem like a silly little gimmick on the surface of things, but it actually makes for quite the compelling juggling act. I've have more than one occasion where my plans are ruined by incorrect wheel timing whether in terms of placing workers or activating them. But it's not overly frustrating and is certain to push you game further. Then there's the sheer diversity of game options and respective paths to victory. The many wheels of the Mayans offer different implied paths to scoring victory points but it usually boils down to specific circumstances and several elements working together. Figuring out that balance and how things all connect is part of the challenge of the game. What Could Be Better: From a design perspective, the wheels are fun but a little underwhelming. I wish something that been done to help the details of the wheels pop out more such as paint details or something. This is most felt when you look at the central board which has so much detail that is hard to see given the pale color of the wheel pieces. The game can also be quite overwhelming at first as there's so much to manage with victory so far away. And the game is faster than you'd expect it to be - the wheel moves steadily along and the first player ability to push the wheel forward a space can really disrupt plans but also bring end game closer a lot sooner. You can say these are all good problems that make the game so fulfilling but perhaps a little harder for new players to get into. TL;DR: Tzolk'in: The Mayan Calendar is a great "spin" on the worker placement game genre that is really creative and unique. You'll come to better understand scoring after a few playthroughs and then things will really go into high gear for you. Thus the game still gets 4 Mayan wheels out of a possible 5.